It’s not too late for holiday cards! Orders arrive in-home about 7 business days after you order them (sometimes quicker, depending on what day of the week the cards are ordered). If you haven’t made your appointment, call tonight! Categories: What's New | Tags: atrium, babies, boys, Christmas, christmas portraits, eastview, emerald square, families, greeting cards, holiday cards, holiday portraits, holidays, moms, natick, rockingham, santa, shoot of the week, south shore, toddlers, trumbull, warwick, weeklypics, westfarms, winter | Permalink. The time for holiday portraits is here! As our phones ring more and more for holiday appointments, one of the most common questions we get on a daily basis is: “what should my kids wear?” Last year we decided to offer an online guide to holiday portrait wardrobe selection. This year, I added to those looks and updated the existing ones, creating an “idea board” for each style, and following up with examples of how our real clients executed those outfits in the past few weeks. So, here you have it– 11 different looks for this year’s holiday portraits. There’s something for everyone and I hope you find it useful in putting together the look that best suits your family. Enjoy! Comfortable is always in. Some Moms have the philosophy that if it’s not the kind of thing worn every day, you don’t need to include a dressy outfit in your family memories. These “preppy” looks are portrait staples! Simple and clean, they are easy to match, and add a touch of formal. How our members are doing it.. If you celebrate Christmas, the holiday season makes you think of Santa. And when you have small children, or a baby especially, you still have 100% control over their wardrobe–they won’t protest because they still don’t know any better. So during this opportune time, there are no limits when it comes to a themed wardrobe! Here are several ways to involve a little Santa magic in your baby portraits. The ultimate combination of cute and comfort, this “Christmas morning” theme is sure to be a big hit with the little ones! Maybe you’re looking for a hint of whimsy, a wink of weather, or you want layered looks that you can use again in the spring. Here they are! This is a great way to mix girls and boys looks that go together but aren’t identical. Above: (a) flight school and (b) “go furry” from the Gap, (c) utility parka from the Children’s Place, (d) “fly boy”, (d) “ice princess”, and (e) bear one-piece all from–you guessed it–the Gap! We’re getting warmer! If you’re all-out ready for a white Christmas, here are some looks that are cute, cozy, and warm. Were your kids the first among their friends to sport silly bandz? Do they go to school in jeggings? Do they Skype regularly? Do they play Angry Birds in between Skypes? If your answer was “yes” to any of these questions, this is what they might want to wear for their holiday portraits. Then again, they might not. These are the “coolest” looks we could find (but we wouldn’t take the risk of calling them that in the company of your kids). Does your bedtime lullaby repertoire include “Dream On” or “Sweet Child of Mine,”? Was your family KISS for Halloween? If so, you might be more inclined to go bold and wear a funkier look. Don’t be afraid to let the “true colors” of your family shine. The holidays can rock too! How are members are doing it.. Finally, we’re into the classic formal styles. There’s a reason these looks have been around for almost a century. As we travel in time, we come to this glamorous era that is now coming back in style. These looks will make cousins, aunts, and grandmothers alike swoon. Last, but not least, here are some beautiful special-occasion looks from today. Festive and fun, these styles mark a holiday season to remember. Now it’s up to you! Have fun selecting your holiday outfits, and don’t forget you can also select your holiday cards ahead of time by visiting our online greeting card gallery. Happy shopping and we hope to see you soon! Categories: What's New | Tags: babies, boys, christmas portraits, families, greeting cards, holiday cards, holiday portraits, holidays, toddlers, what to wear, winter | Permalink. Happy October! 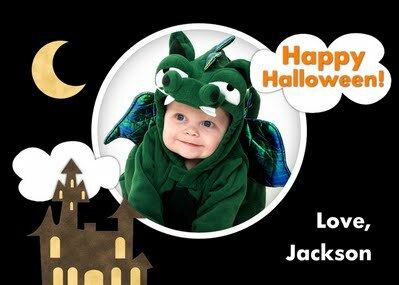 We just added some more adorable Halloween cards to our selection. They’re on sale for $9.95 a sheet (or $8.95 for members) and like our other sheets, they are printed instantly. So if you’re coming in this month to take advantage of our October holiday card sale, bring the costumes in for a few shots! It makes for a fun photo shoot, and you’ll always have memories of what they were for Halloween this year. Most of these are available in a horizontal format too. They come 8 on a sheet (they’re mini-cards, about 3.5″ tall) and we even provide fun-colored envelopes. How much would Grandma love to get one of these in the mail? Categories: What's New | Tags: greeting cards, halloween | Permalink. We can’t believe it either, but it’s already that time of year….. time to unpack the sweaters, turn on the heat, help with homework, and start thinking about holiday gifts. If you’re a Rewards Member, it’s smart to start thinking about portraits too, because we offer BIG savings on greeting cards for the early birds! Get them done in October, save 25%. Get them done THIS MONTH, save 40%. The earlier the better. And yes, our studios are already geared up with seasonal props! Check out our new selection of greeting cards for 2011 below, and call today- appointments are going quick! Categories: What's New | Tags: Christmas, greeting cards, holiday cards, holiday portraits, holidays, news, winter | Permalink.